September 30, 2015 /0 Comments/in Hypoxic Ischemic Encephalopathy (HIE) /by Reiter & Walsh, P.C. As you’ll learn in this section, HIE (hypoxic ischemic encephalopathy) is pervasive in the birth injury cases our attorneys handle. A wide number of medical mistakes and obstetrical complications can cause HIE, and HIE commonly causes cerebral palsy, permanent infant brain damage, epilepsy and seizures, and a number of other lifelong injuries and disabilities. Throughout this page, our Michigan HIE lawyers will discuss a few of the multi-million dollar HIE cases they’ve handled and won. If you require a Michigan lawyer handling HIE cases for your loved one’s injuries, please reach out to our attorneys today. We’ve listed our contact information at the bottom of this page. The following hypoxic ischemic encephalopathy / HIE cases relate to a wide number of birth injuries, obstetrical complications, and medical errors. We hope you learn more about hypoxic ischemic encephalopathy, birth injury, and medical malpractice along the way. 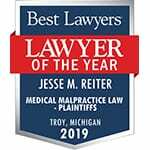 Should you have any questions or case inquiries as you read through these birth injury and HIE lawsuits, please reach out to Reiter & Walsh ABC Law Centers and our Michigan attorney handling HIE cases. Before we delve into the details of our past HIE cases, verdicts, and settlements, it is important to explain what hypoxic ischemic encephalopathy is. HIE is a dangerous form of neonatal brain injury. A baby develops hypoxic ischemic encephalopathy when he or she suffers from oxygen deprivation around the time of delivery. The insufficient flow of oxygen to the baby’s brain results in permanent brain damage, which often leads to cerebral palsy, learning disabilities, intellectual and developmental disabilities (I/DD), movement problems, epilepsy, seizure disorders, and other lifelong disabilities. Hypoxic ischemic encephalopathy is also commonly called HIE, neonatal encephalopathy, NE, intrapartum asphyxia, or birth asphyxia. In this section, our Michigan attorney handling HIE cases will discuss a few of the many HIE cases Reiter & Walsh has won over the years. This HIE case involved a fetus who was in fetal distress for too long before being delivered by emergency C-section. The baby was ultimately diagnosed with hypoxic ischemic encephalopathy and cerebral palsy. When babies are showing signs of fetal distress, they are almost always experiencing oxygen deprivation and brain damage. It is critical that medical professionals swiftly address fetal distress and deliver the baby to ensure the baby does not develop HIE. Our Michigan HIE attorneys helped this family win nearly seven million dollars. This HIE case involved a baby girl who experienced a fetal stroke, HIE, and permanent brain damage. Medical professionals should have delivered the baby girl via emergency C-section when she first showed signs of fetal distress, but instead, they delivered her vaginally with a risky vacuum extractor. The medical professionals continued to fail to address her rapid heart rate and fetal distress, and ultimately they noticed she also had a nuchal cord. Nuchal cords are obstetrical complications in which the umbilical cord is wrapped around the baby’s neck. Nuchal cords commonly cause oxygen deprivation and HIE. The baby was ultimately diagnosed with HIE and cerebral palsy. Her family contacted Jesse Reiter, partner at Reiter & Walsh and Michigan attorney handling HIE cases, and our legal team secured $6.15 million for her. This HIE case involved a baby with HIE and cerebral palsy from Pitocin misuse, a delayed emergency C-section, and umbilical cord compression. Medical professionals failed to monitor the baby’s heart rate, and they used Pitocin to encourage vaginal delivery when they should have called an emergency C-section. This baby’s family contacted Jesse Reiter, partner at Reiter & Walsh and Michigan attorney handling HIE cases, and our Michigan HIE lawyers secured $4.75 million for them. This case involved several instances of medical malpractice. Medical professionals failed to recognize that the mother was in labor, had preeclampsia, and was past her due date, and the baby suffered from HIE (hypoxic ischemic encephalopathy), cerebral palsy, developmental delays, and cognitive disabilities. Our Michigan HIE attorneys helped this family win $4.75 million. This Michigan HIE case involved hypoxic ischemic encephalopathy, cerebral palsy, mismanagement of maternal genital herpes, gestational diabetes, macrosomia, scabies, meconium aspiration, and delayed emergency C-section. Our Michigan HIE lawyers and attorneys helped this family win nearly four million dollars for their case. This HIE case involved hypoxic ischemic encephalopathy and cerebral palsy from mismanaged fetal presentation and improper fetal monitoring. The baby was in face presentation, and was born with HIE, cerebral palsy, and cognitive and developmental delays. Our team of Michigan HIE attorneys helped the baby girl and her family obtain almost four million dollars for her injuries. Our team of birth injury and HIE attorneys have helped countless victims of medical malpractice obtain compensation for their injuries. Our medical malpractice attorneys are unique in that they only handle cases related to birth injury, giving them the specific and extensive knowledge and experience necessary to win complicated, multi-million dollar birth injury and HIE cases. To read about more of our HIE cases, verdicts, and settlements, please visit this section of our website. If your loved one was diagnosed with HIE (hypoxic ischemic encephalopathy) or another permanent injury or disability from medical malpractice, we encourage you to reach out to our legal team today. You may be entitled to compensation for your loved one’s injuries. Our Michigan HIE attorneys specifically focus on hypoxic ischemic encephalopathy, cerebral palsy, and birth injury cases, giving us the depth of knowledge and experience necessary to win complicated, multi-million dollar HIE cases.